✿Elegant and Modern Appearance: The color of glass is grey and natural wood and metal frame, the color is harmonious and comfortable. Glass table top brings modern style to the desk. Height of glass top can be adjusted to meet your demands. 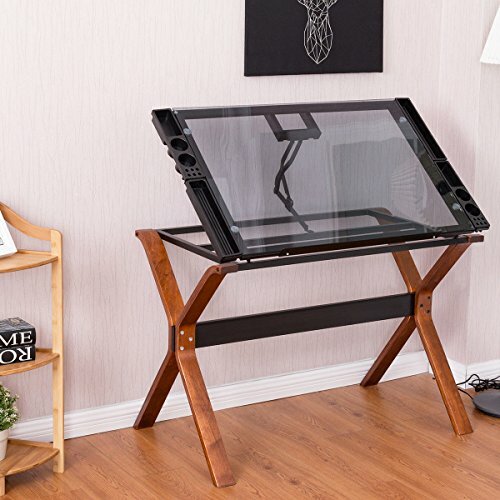 The drafting desk is functional and will be beautiful furniture to your home or office. ✿Heavy Duty and Durable: The desk features 0.20 inch thick glass tabletop, which is quite reliable for its sturdy construction. Table top can support 110 lbs and will meet your daily demands. The drafting desk provides years of using. It will win your praise of its durability. ✿Practical and Multifunction: Large full-size workstation will never let you down. You can lay your books, papers, documents, laptop on the spacious tabletop. The most attractive function is: The tabletop is adjustable. You can sit or stand to work according your mood. The table can be used as writing table and it will service well as drawing table. It can totally maximize the daily working and reading enjoyment. ✿Easy to installation and Clean: With clear manual the assemble is not hard for all adults. Single man can finish it. With wet cloth you can wipe dirty stain or dusts easily. It's easy to move the desk is perfect for dome or rental. ✿Shipping & Customer Service: Ups or usps will deliver the item to your house in 3-6 business days after you place an order. We packed this item as good as we can, if there is any damaged parts, please contact us freely and provide pictures of damaged part for us to solve the problem as the way you want(discount or replacement).